If you live in northern Virginia, you know that we’ll all be mulching our yards in just a few weeks! It only takes a couple warms days in the middle of winter to get everybody thinking about Springtime and making some nice changes to the landscaping. Even if the Groundhog extends Winter for a few weeks, you need to start planning your landscape project now. Not only will you need make your decisions on what to do, but in some cases you may need to get estimates and book time with your landscaping company. Our friends over at the Gateway Garden Center in Warrenton, VA recently wrote about planning your landscape project, and have some pretty good advice. 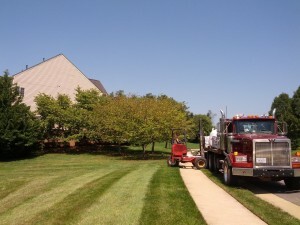 The reason behind your landscape project is important to establish before the first shrub is planted. Common reasons for landscape projects include improved curb appeal, functionality, and privacy. Additionally, landscaping can address any safety issues if it results in enhanced privacy or better nighttime lighting. By setting goals, you’ll be able to more efficiently plan spacing and decide on necessary materials. When beginning to plan your landscaping project, it’s important to start broad, coming up with a look or feeling you want to evoke. By thinking of this goal through the entire design, from trees and shrubs down to the hardscape design, you’ll be able to focus your goals in the beginning. This will allow you to avoid design mistakes along the way. After your plan is complete, it’s time to shop for materials. Whether you’re tackling the project yourself or hiring a professional landscaping company, it’s important you purchase the best landscape supplies Gainesville has to offer. When it comes to materials, there are a lot of factors to consider. There is a wide variety of trees, shrubs, plants, and building materials that all have different benefits to offer. Because of this, it’s important to work with your local supplier to ensure you get the best landscape supplies Gainesville can provide for you. After you have your materials, it’s time to get to work. If you decide to hire a landscape architect, it’s important you pick a contractor that’s right for you. No matter if your project is big or small, it’s important to establish expectations with your contractor, while still considering their professional opinion. By working together, you’re sure to have a beautiful landscape in no time.